I recently discovered (but have never drunk) what you see before you. It is from my father-in-laws secret stash of whisky. He has never opened this, The Glenfiddich 18 Year Old Ancient Reserve in Royal Dalton Decanter. What can I tell you about this item? Not much! In fact multiple searches on the internet have come up with very little about the what and when; and how often this item is or was produced. I do not know if this is made every year by Glenfiddich or simply a one off batch, as there is no markings to indicating the year or number of batches. 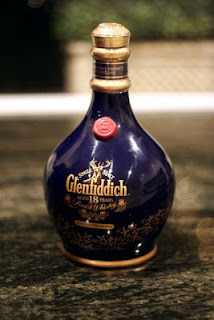 This item was approximately 15 years old when purchased (maybe a wee bit more, as the story changes slightly each time) and falls into the period when Glenfiddich was aging and labelling their whiskies differently to nowadays. Yet to be opened, but I've heard lots of promises that it will be soon. From what I have found it retails for around 100 pounds, but then again I do not no if this is the price of a more recent release. Nonetheless, you can quiz Steve on the story behind it on Saturday as he will be joining us on our whisky tasting extravaganza. No, this bottle will NOT make an appearance...and be careful not to offer him anything but his whisky 'neat,' as these Polish can get pretty frisky when it comes to how they take their drink. Any info you can dig up on this sucker will be greatly appreciated...or if by chance you have seen it or tasted it, this info will also be most welcome.